I know that authenticity is an overused buzzword these days, but I really believe in it. I believe that we have been “shielded” our whole lives into thinking that who we are is either too much, or not enough. So we dim our shine to make ourselves safe. Imagine if we all stopped giving a s*** about what the world thought of us? Imagine how magnetic, unstoppable and powerful we would become? I guess my movement would be to set the world free to SimplyBe. 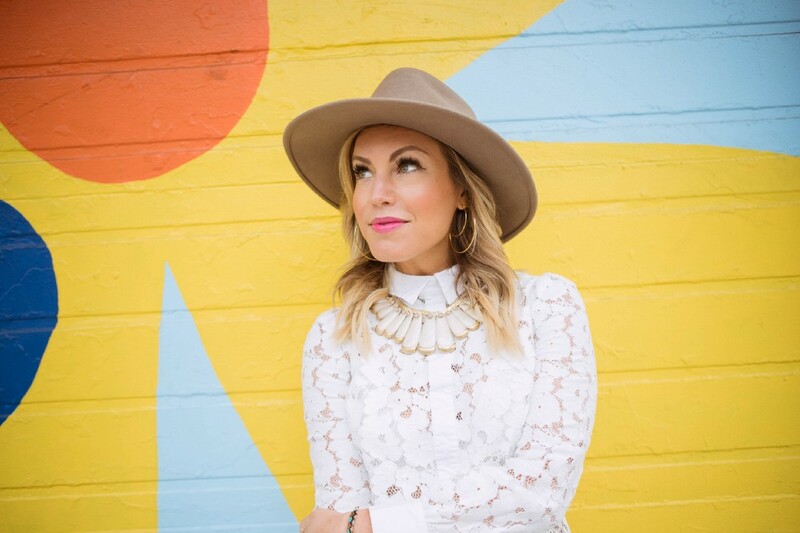 I had the pleasure of interviewing Jessica Zweig, founder of the young Chicago business SimplyBe. Agency and recent recipient of the renowned Gold Stevie Award for Female Entrepreneur of the Year — an incredible achievement as she also celebrates her company’s 2-year anniversary. Since its launch in fall 2016, SimplyBe. has solidified its reputation as Chicago’s only provider of personal branding and brand management services, racking up high-profile successes for up-and-coming professionals, executives and businesses (from startups to the likes of Nike and Red Bull) as the agency continues to fill a digital and creative void in the Chicago market and beyond. The SimplyBe. formula has proven to be tremendously successful as Jessica has accomplished in two years what many would-be entrepreneurs would dream of — combining her expertise (digital marketing) with her passion (authenticity) to create a one-of-a-kind approach, and rather quickly achieving growth and results for a dynamic roster of innovative clients. I started my career as entrepreneur in 2008, at the literal dawn of social media. I was running a popular online magazine for 6 years, and it was during that time that I built my personal brand by accident, and then eventually by design. I departed my magazine in 2014 to go off on my own to start SimplyBe., which at the time was just a one-woman consultancy. I sent out one email to my network, and posted one update on Facebook, and within 5 business days I had five figures worth of clients. That was my AHA moment on the power of personal branding. It was something I wanted to harness while teaching others to do the same. That was how SimplyBe. evolved to become the go-to personal branding firm. Because I walked my own walk. I am a huge proponent of operating outside of my comfort zone. I am a firm believer that it’s the only place you really grow and expand. A few years ago, at the beginning of SimplyBe. “2.0” where I was starting to only focus on personal branding, I started blogging about personal branding consistently on LinkedIn. A former client of my first business, who happens to be a head of marketing at Heineken USA reached out to see if I would be open to hosting a workshop on personal branding in New York City for his intimate team of executives. I had never taught a workshop before, but instead of saying no out of fear, I said yes. I ended up creating a two-day curriculum that has now become one of the signature offerings of my business. I have now taught this workshop dozens of times across major markets and even in other countries. My point is — you never know how a relationship might lead to an opportunity that leads to a flagship product or revenue stream. Staying open to the challenges that come my way have been transformative for my business. I make mistakes every single day. Some of them are funnier than others, but I think if you can find the humor in even the worst of mistakes, you’re winning. I believe what makes my company stand out is that we don’t take ourselves too seriously and that we all operate with Love. I think this is clear in our brand as well as our culture. For example, when you come to our website, there are photos of me and my team in blow-up floaties, there are pineapples everywhere and an overall cheeky tone. This is NOT your typical agency website. But it transcends branding. My company culture is something I am incredibly proud of. We are a team of mainly women and we’re incredibly supportive and loving with one another. I have a zero-tolerance policy around gossip and negative energy, and I believe I attract the kind of team members who operate at a high vibrational frequency of kindness, joy and respect. I recently was at an event and met a woman who works for another company. She expressed to me how much she dreamed about working for SBA, being surrounded with “lots of pineapples, yellow and good vibes.” I knew in that moment that our unique brand position was working. Yes! I am releasing a schedule for a series of public workshops in 2019 called “The SimplyBe. Experience.” These will be two-day workshops teaching guests the ins and outs of building and growing a personal brand. From personal identity to brand strategy, to how to land a book deal, to how to grow an Instagram following, to how to position yourself as an expert on LinkedIn. These workshops are literally the “keys to the kingdom” of what we do at SBA, and will allow anyone the opportunity to receive best-in-class branding, strategy and digital marketing support for a fraction of what it would cost to hire an agency. The first 2019 workshop will take place in Chicago on March 30–31 at the Union League Club of Chicago. Tickets will go on sale in January. Don’t be afraid to show your heart and lead with compassion and empathy. I think that is a huge opportunity we have as women, to create communities for empowerment within our organizations. Additionally, implement time for coaching and mentoring your team, and create opportunities for them to grow beyond your four walls as far as trainings, higher education and support from other professionals in your community. When your team feels your nurtured in more ways than one, they will not only thrive because they feel valued but will work harder and with more passion. This will drive your business forward. It’s important to have an “emotional support team” around you. I believe women innately operate from our hearts and when in the role of leadership, it’s easy to become emotionally invested in your people, and therefore get emotionally depleted. The larger your team becomes, the more challenging it can be to keep everyone on the same course. The truth is, you cannot control anyone else’s responses or experiences. The only thing you have control over is yourself, and it’s essential you protect and preserve your well-being. Working with mentors, advisors, coaches and therapists of your own will help make you stronger, clearer and more balanced when making decisions as a leader. It all comes back to you. My mentor is a woman named Denise Senter. She is about 13 years older than me and has built a really incredible and aspirational career as a marketing executive. We met in a yoga class years ago when I was going through one of the darkest periods of my professional life. I was in the middle of a fundraiser and was really struggling financially. In so many ways, she took me under her wing and offered me not only some of the most invaluable advice of my career, but also went on to work with me on various projects. She gave me the chance I needed, when I needed it the most. She’s also shredded me to bits in the past when I’ve made mistakes and I am equally grateful for those moments. I LOVE to be coached, and her coaching — albeit painful at times — has made me a better leader and a better person. I have learned so much from her when it comes to being a powerful woman in business, but most of all, I have learned the power of grace and kindness in business. Follow your gut. I get a lot of feedback that I am a powerful decision maker. I think that’s a strong quality in any leader. I don’t hem and haw about things too much. If it feels right (or wrong), I act. I apply my intuition to which clients I take, who I hire, who I fire, what opportunities I say yes or no to, and so on. I think my incredible client list and my all-star team are shining examples of what following my gut has brought me. Communication is the lifeblood of your business. I am what some might call an emotional glutton. I like to TALK about things. I used to be ashamed of this fact and instead, let things fester. As I’ve “grown up” in business, I find that clear, open and honest communication, no matter how uncomfortable, will make or break your business. Know when to turn it off. It’s easy to get consumed and literally addicted to work. I draw a boundary every Friday at 5pm. (Granted I turn it back usually on Saturday or Sunday). But Fridays are holy. That’s a night for my husband and me to be together, no one else. If you can consciously infuse little moments of “balance” into your work week, it all becomes much more manageable. Show gratitude. To your team. Your clients. Your advisors. Anyone that has opened a door or sent an email you needed that day. Gratitude is the precursor to joy and when people feel valued, everything shifts. Never stop learning. Invest in courses, trainings, conferences and coaching. Any form of higher education is going to make you a better business person. I work with amazing coaches (Derek Halpern of Social Triggers, and Leah Neaderthal, founder of SIGNED is another), and have attended various conferences (Mindvalley U and A-Fest being some of them) that have literally upleveled my game beyond what I considered possible. Don’t do this thing called “entrepreneurship” alone. Invest in yourself, and watch yourself fly. The name of my business is called, SimplyBe. It was inspired by a tiny tattoo I have on my wrist of the same words. The name for this business came to me at a rather dark time in my life, when I felt totally out of alignment with my own personal truth. I had gotten the tattoo years earlier as a reminder that I am enough, as I am, exactly where I am. I started a business and named it SimplyBe. to essentially inspire the same in other people. I know that authenticity is an overused buzzword these days, but I really believe in it. I believe that we have been “shielded” our whole lives into thinking that who we are is either too much, or not enough. So we dim our shine to make ourselves safe. Imagine if we all stopped giving a s*** about what the world thought of us? Imagine how magnetic, unstoppable and powerful we would become? I guess my movement would be to set the world free to SimplyBe. I believe this to my core. Whenever I consider this fact, it diffuses everything. It puts everything into perspective. Being a leader and growing a business can be stressful, painful and overwhelming at times. I live by this principle, and am able to take everything that happens to me — good or bad — as a lesson. And lessons are gifts. A dream sit down of course would be with Gary Vaynerchuk, who inspires me beyond measure. Another truly aspirational meeting would be with Danielle LaPorte. I LOVE everything she stands for. If I could emulate anyone’s career, it would be hers. I think she’s hit the nail on the head when it comes to building a personal brand that is in service.